EQUI is an upcoming ICO that aims to give investors exposure to real-world companies by investing in startups that focus on Next-Gen technology, real-world assets and companies that aim to disrupt and revolutionize key traditional industries. All of this exposure is given to investors in the form of tokens that are stored on the Ethereum platform, effectively bridging the gap between the cryptosphere and real-world startup venture capital. The first thing that struck me with Equi is the wealth of experience in the team. A lot of ICOs are launched by college kids who don’t have any experience in the business world. This is not the case with Equi. Doug Barrowman, the Lead Founder, has over 30 years of experience in investing in startups. Doug serves as the Chariman for Aston Ventures, an experienced London based venture capital fund, and draws upon extensive connections within the venture capital industry. Also on the team is Baroness Michelle Mone (yes, she is a real Baroness of the Order of the British Empire). Baroness Michelle Mone has experience in not just investing in start-ups, but actually creating her own businesses that have gone on to do exceptionally well. So much so that she was made a Baroness by Her Majesty the Queen of England. She is widely recognized in England as an award-winning Entrepreneur, but has also won awards in the US. She created a lingerie empire that is now famous worldwide, winning the title of World Young Business Achiever at the Epcot Centre in Florida. All other key team members have extensive experience in entrepreneurial-ism and start-up funding. Holders of EQUI tokens will have direct exposure to the profits of the company. On the EQUI platform, investors can choose the ventures they wish to be a part of, and thereby gain a very generous 70% of generated profits. The thing I like about the proposed platform is that investors can themselves choose which startup companies they want to expose themselves to. 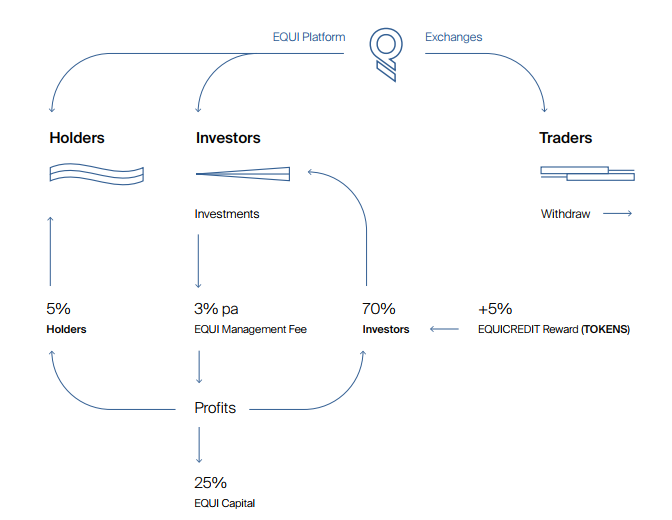 Rather than relying on a basket-index of all accumulated investments like traditional hedge funds, on the EQUI platform token holders choose where to allocate their exposure. In my opinion, 70% is a very generous profit share, with most dividend-paying projects on the blockchain usually returning only 20%-50% of profits, and not allowing the flexibility to choose investment exposure as will be possible on the EQUI platform. There is also a fantastic system whereby people can invest in the future of the EQUI platform itself without undertaking any investment risks. 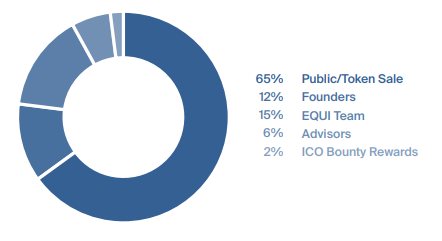 By simply holding tokens on the EQUI platform without allocating them to specific investments, investors will receive a 5% increase in their EQUI credits based upon the number of EQUI tokens they hold. This is similar to how a “proof of stake” dividend paying coin might work, except no staking is required, and it allows those who believe the value of EQUI itself will go up to gain additional tokens whilst they hold the tokens for long term investment. There will be a total supply of 250 million EQUI tokens, priced at $0.50 USD each during the ICO. Investors with large capital ($100k minimum) can join the pre-sale which will run from 1–8 March 2018 and receive a 25% bonus on their issued tokens. The main public ICO doesn’t have such minimum investment restrictions (only $100), and will run from 8–31 March 2018. The public ICO will have an initial bonus of 15% for early-birds which will last for one week, so make sure to register early. The thing I like most about this ICO is that a large proportion of the tokens are issued to investors — 65% to be exact. The tokens that are allocated to the team also have time-vesting restrictions. The thing I feel most confident about though is that this team has experience with other venture capital companies, so the likelihood they will abandon the project just to dump their tokens is incredibly low. Whilst there are numerous ICOs that aim to invest in traditional companies and allocate some of the profits to their token holders, most of these teams are too heavily technically focused with little investment backgrounds. At the end of the day, you don’t want programmers without investment experience as your project leads making decisions to invest in startups that aim to revolutionize certain industries; you want actual experienced venture fund managers leading the ship. The Equi team is in a different league of experience to these other projects, and that’s why I believe their proven track record of venture funding makes the Equi project a good long term hold, and not a short-term flip.